As more Americans choose to drive bigger SUVs and pickups, the demand for diesel engines strengthens, due to the technology’s reliability, fuel efficiency and lower cost of ownership. In 2018, even as overall automobile sales in the United States were up by only 0.5 percent according to Wards, 50,000 more diesel vehicles were sold, led largely by pickup and SUV sales. For light duty vehicles (Class 1-3), sales of diesel vehicles reached their highest annual level, coming in at more than 500,000 units, or just over 3 percent of total vehicle sales in the United States. 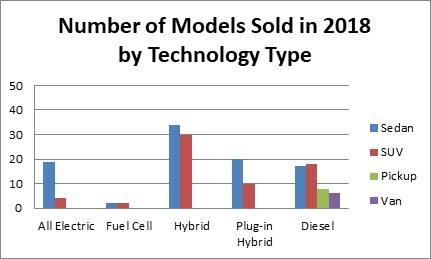 This share exceeded that of hybrid vehicles, which came in at almost 2 percent of total sales, as well as the sales of plug-in electric vehicles (plug-in hybrids and full-battery-electric vehicles combined), which came in at around 2 percent of total sales. Class 2 and 3 pickups have and continue to be the largest users of these engines, with an overall growth rate of 12.5 percent over 2017. Over a three-year period (not annualized), this category has seen a very strong growth rate of 35 percent, with the strongest growth in 2017 and 2018. Diesel sales in smaller vehicles showed modest growth in 2018, after a drop in both 2016 and 2017. Sales from these vehicles in 2018 increased by 9 percent as compared to 2017.